I'm so happy to finally be able to share with you the rest of our new(ish) home after four months of feeling out the space, finding everything a home, donating, thrifting, and filling in the gaps with DIY. You can see the kids' room here. Our space will probably change again within a year since we're a military family now so it was important to make it feel like home as soon as I could rather than seeing this as a temporary place that wasn't worth the effort. I don't want to bore you with every detail of every corner or the fact that I have a story about almost every single item in our home so I'll share the majors and if you have any specific questions I'll try to answer them in the comments below. We live in an older house with lovely hardwood floors, plaster walls, two bedrooms, one bath, a large studio, and an unfinished basement. The exterior doesn't have much of a style but the inside has enough charm to suit us. We have always been renters so I've learned to decorate standard off-white walls with plenty of color in our textiles and furniture. We both love the character of vintage and have a collection of mid-century and industrial pieces that I've gathered in the last three or four years. All of our furniture (except our bed) and most of our art/accessories/kitchenware/linens have been found at a flea market, garage sale, thrift store, by the side of the road, or handed down. We happen to have landed in a city full of affordable vintage which has made it so fun to gather together a whole household full of second-hand that we truly love. Almost everything we had from the last house was purchased after we'd moved in and with that specific house in mind. Most of it works in this space but the biggest change is having a combined living/dining area. In our last house the formal dining room was quite large and doubled as my studio. We ate from the table as a family whenever it wasn't covered in fabric or paint, which was most of the time, and there were always projects stacked along the walls. We sold our lovely vintage Lane coffee table and the two matching end tables from our last home tour to have more room for baby gear when Ruby was born. There are days when I'd love to have something to set my coffee on but I love that our kids have plenty of space to chase each other through the living room now. It's been one 'must have' that I've been happy to give up as our needs have changed but I may hunt something similar down in a few years. The yellow chairs used to belong to my friend, Janae, who purchased them from Funtiques, a fantastically curated vintage shop on Commercial St. here in Springfield. I had always admired them at Janae's house so when I saw these on Craigslist I e-mailed to ask if they were hers. I just knew they'd be snatched up right away but decided if they were still available after a week I'd buy them. Long story short, Janae sold them to me and even hauled them over to my house and I've never regretted replacing our previous set. 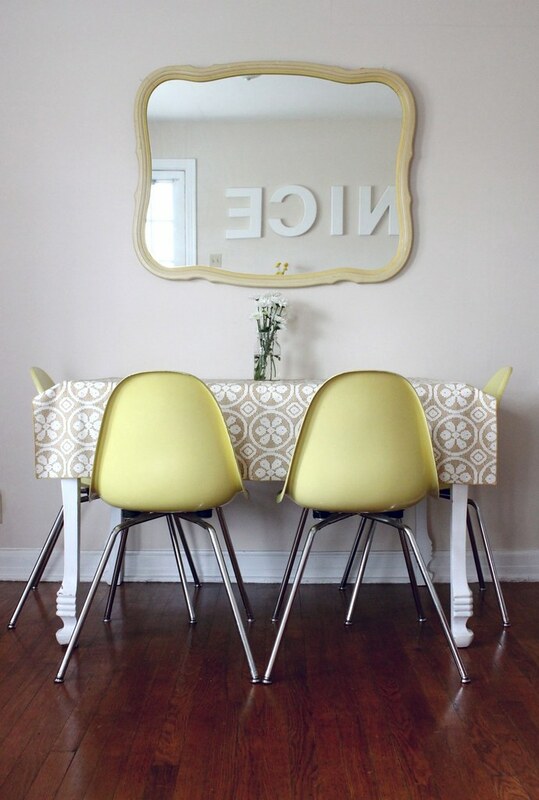 That mirror above the dining table was found for $5 at a garage sale in our old neighborhood, the table was $40 on craigslist, and the vinyl tablecloth was $2 at a local flea market. I can remember what I paid and where I got almost every thing in this house and have always wanted to tally it up. It's amazing that I have all of that filed away but forgot to put the trash out today. The large metal wardrobe was a craigslist find that I almost passed up. We have lovely friends who always, always let us borrow their truck to haul big things home and I was able to load that up for $15. Two weeks later I had sanded and painted it pink. I'm now ready to tone things down and may repaint it minty blue or dark gray in the coming months but pink was fun for awhile. It houses all of our Christmas decorations and random items I change out seasonally. 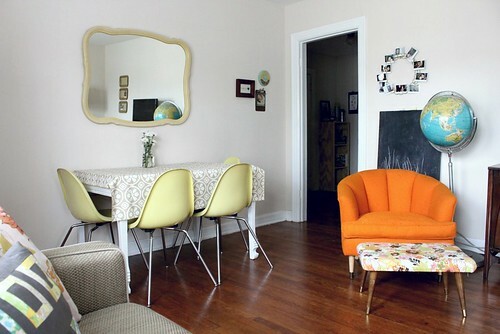 The orange chair is from Urban Flea Market (Charley's) and will someday be reupholstered. I covered the stool with new foam and some inexpensive fabric. It doubles as a launching pad. The crooked globe almost didn't fit into the back of Elsie's Prius on a thrifting excursion and the chalkboard was made from a piece of pre-cut plywood and chalkboard paint. This wall is my favorite. It was one of the last to get decorated because I didn't know what to fill it with. I didn't want to recreate the same art wall from our last house but didn't have anything else on hand that felt right. One day I was at Urban (Charley's) and spied white plastic letters strewn down an aisle. After finding enough to spell something relevant, I brought them home. I decided to leave them white rather than spray painting them to let their impact be a little more subtle. 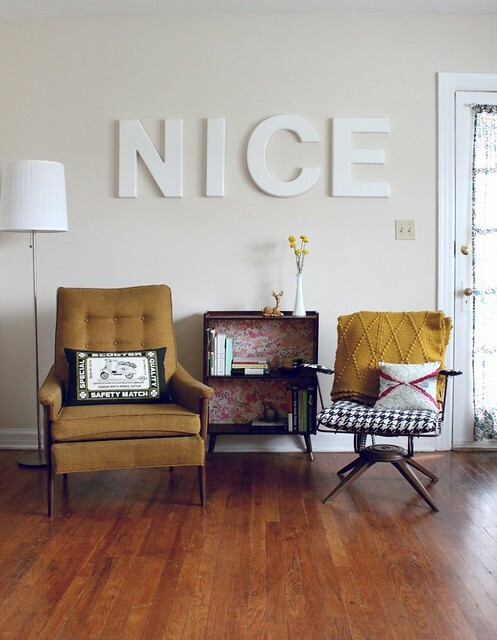 My third grade teacher, Mrs. Kirschner, regularly told us that 'nice' was a lazy word. She wanted us to become more creative in our selection of descriptive words rather than using the popular fallback. That lesson has encouraged my writing to this day and often comes to mind when I have a choice between sharing something generic or something colorful. It's also funny to get the same reaction from every person that walks in the door and turns around to see it. You can imagine their tone when they say, "Nice!" I originally had this shelf in the kids' shared room in the last house but it was begging to be added to the party under the sign in this house. The vintage wallpaper is a 'nice' compliment to the golden tones of the chair and throw on either side. I've currently replaced the yellow bud vase with a larger arrangement of something from the fence line in our backyard and the pink blossoms are gorgeous. This little corner is tucked away between the sideboard that houses our entertainment set up and my new favorite vintage chair. The crates used to be in the bathroom but are just the right size to corral some of my favorite art and diy books. I attached the metallic trays above them with 3M strips and have some polaroids from the old house on display with magnetic clips. I didn't share a photo of the vintage Broyhill sideboard with our flat screen because the whole set up isn't really that aesthetically thrilling. We use a flat screen as a monitor and have an external hard drive, mac mini, speaker, wireless keyboard and wireless mouse to watch movies and tv online and to use as a second computer. The sideboard was a craigslist find that was going to be burned if we hadn't brought it home. It's one of my favorite pieces in our house. When decorating this new space I didn't want to fall back on old arrangements and ideas from the last house because it felt like an opportunity to play and try new things. I always want our home to be warm and welcoming but I love that it can have a sense of humor, too. Having our home reflect who we are and be somewhere we enjoy spending LOTS of time is important to us and we're thankful not only for this space but for the friends and family that we're able to share it with. I'll be sharing our kitchen next and then our bedroom so stay tuned for parts two and three! Couch, Craigslist. Curtains, handmade from Urban Outfitters bedspread. Record Player, Urban Outfitters. Lampshade, Target. Scooter pillow, blog giveaway. 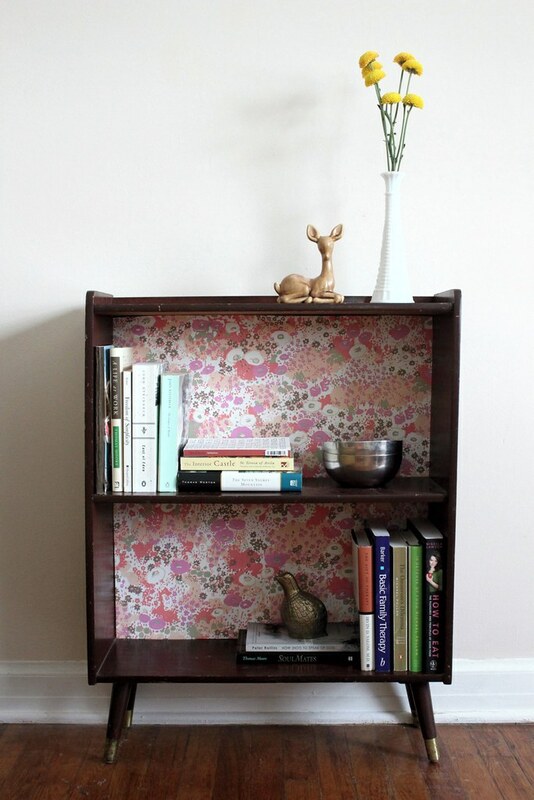 Vintage wallpaper, CraftVintage, Art, MaryKateMcDevitt, and LifeLovePaper. Cross-stitch, handmade by me. You are the sole reason that I like houndstooth, just so you know! 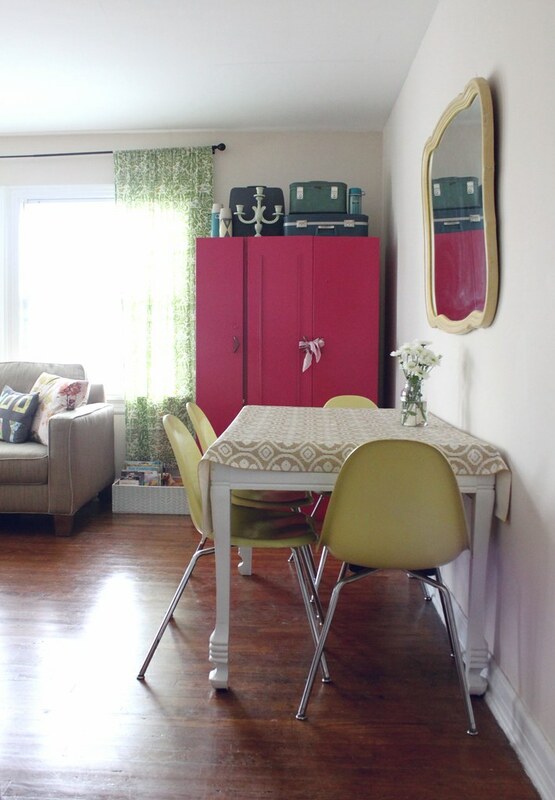 Such a lovely living/dining room, Rach! I've had my eye out for a metal cabinet or a set of lockers on Craigslist ever since you showed that pink cabinet last year. So inspiring! you have impeccable taste. such an eye for design. eeeee. what a beautiful home. Love the lamp... Remember where you got it? It's lovely Rachel, you have such great design ideas, very inspiring! love this! 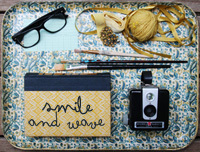 the tray/magnet/photo display idea is fabulous. I love how you created a fresh new look in your home while keeping in tune with the same vibe. I'm in the process of setting up house and after 4 months I'm finding it hard to resist the urge to copy how I had everything arranged in my previous place-just to get it done already! lovely home! The 'Nice' letters on the wall are fabulous. Looking forward to seeing more of your new home! you do vintage decor like no one else!! I love (am in love) with your house! I mean the kids room is awesome, the rest of the house is amazing...I should hire you to work on my house. haha! I'm totally impressed! I have been so excited to see your home tour! Your homes are pure inspiration. I'm happy to see another renter who can make their home so beautiful that you forget the walls are 'renter white'. Its so "NICE" hehe. I love it! I can't wait to have my own house to decorate! it looks fantastic rachel!! i LOVE that couch! i would love to replace our red couch with a neutral colored one like that. and so nice to have such large windows! i love your style! 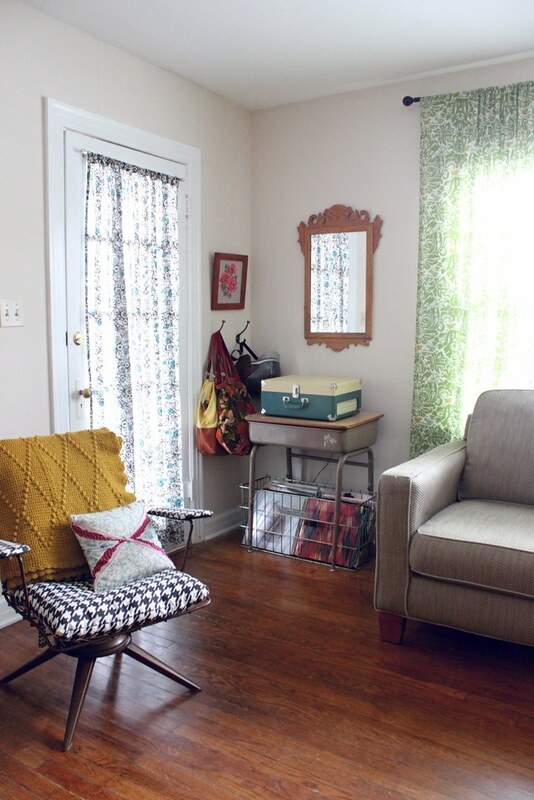 i love the vintage, uncluttered, warm homey feeling you've created. can you tell us more about your record player? i've been interested lately in finding a vintage record player, but i don't know much about them - finding them in working order, finding new parts, etc. thanks! My family is pretty broke but it makes me so happy to see that you can make something so amazing from inexpensive finds. I swear I had given up on my house until I saw your blog. Thank you. It is all so "nice"...or should I say creative, colorful, soothing, peaceful, spunky...how in the world you pull that off in 4 months is beyond me! seriously, you're incredible. beautiful beautiful beautiful! It's my dream house! I love the variety in color and textile. Everything has such a simple, clutter-free feel. Love it all! ahh your home is so beautiful and cosy! and there is so much space! ahh i wish i lived in a house not in a small, ugly, noisy flat! I LOVE you living room/dining room! 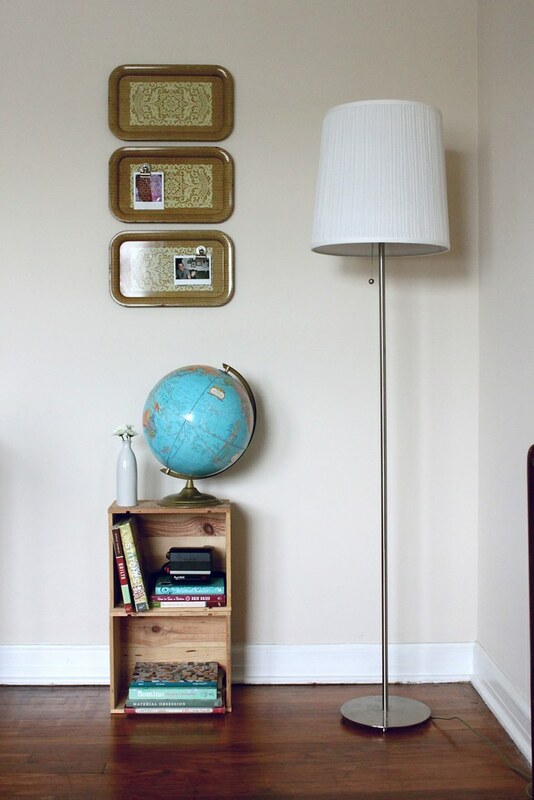 Great inspiration :) I'll be moving soon and need ideas for our new place and I would love something like this! 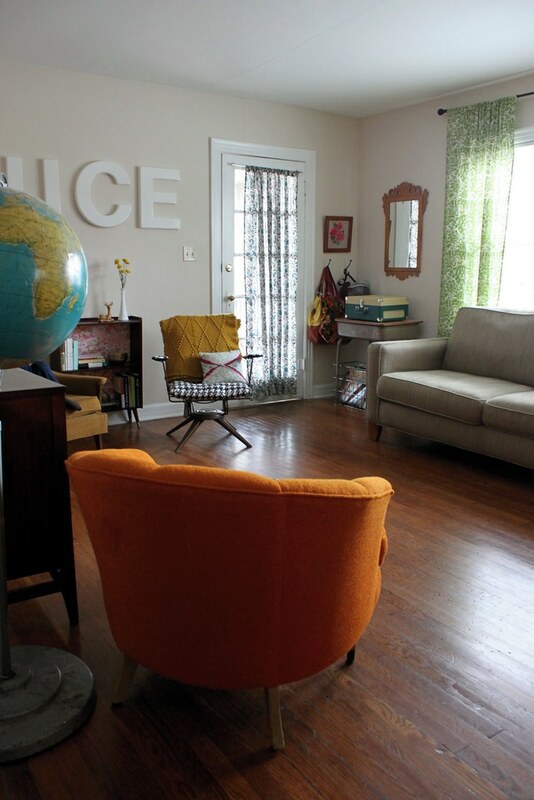 Love, love, LOVE your living room. I adore a room that isn't terribly matchy-matchy, and this room flows so smoothly. It's gorgeous, kid friendly, and seems incredibly functional - you should be proud! 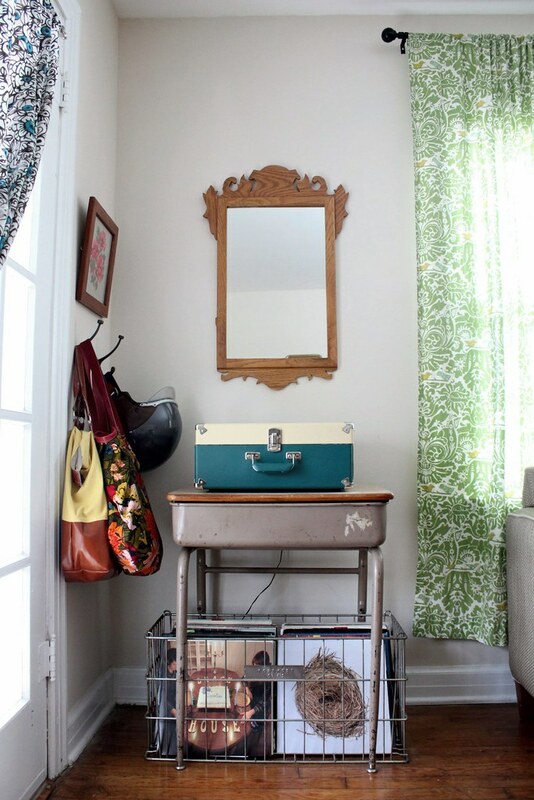 I have some metal trays I didn't know what to do with, but I love them on the wall so I'm going to use your idea. Thanks! i love it. everything about it. love love love. I love how you have set up your space! All the textures and colors are wonderful. My favorite things are your drapes (terrific patterns!) and your orange chair! Orange was my wedding color two years ago and ever since, orange has always shouted out HAPPY HAPPY! to me. Thanks for sharing your house! The living room looks really great! I appreciate you posting pictures and explaining all the details and pieces. I just moved in to an apartment of my own and plan to thrift all of my furniture as well. I have been following your blog for awhile now, but haven't made a peep yet. But I just wanted to say thank you for the inspiration. I can't wait to see the rest. Happy Friday! Thank you, everyone! It was such a long process of gathering for the old house so to have almost all of it work for this space was so great. I think it's my favorite part about using all vintage. It mixes and remixes so easily! The lamp base was thrifted but the shade is from Lowe's. The record player is from Urban Outfitters by Drumley. I have never had any luck with a vintage RP that both worked and looked great so we finally got this one and we love it. I am So inspired by you. What a truly talented person you are. Really. I love how you've used the clipboard as a photo frame, I'm so doin' that! I've picked up some other ideas too, but I'm sure they wont look as good as yours. You've truly created your own unique look and I Love It! Well done my friend. Well done. I'm so goin' back for tour 1 & 2...must have missed those. This room is nothing short of fabulous. I love how it feels like if I sat in it I'd just keep on noticing little extras. 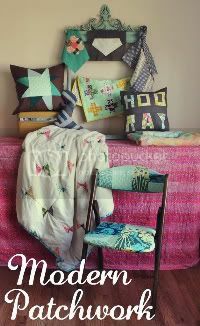 I love the way you have arranged your items and how everything is so mix-matched yet so very co-ordinated at the same time. i love every aspect of this room! you are inspiring me to get my act together and keep cleaning! Supa fly adorable!!! I think one of my fave parts are the metal trays with magnetic clips and Polaroids!!! I love that you are not afraid of change and willing to paint that AWESOME pink chest a minty blue!!! I would prolly stick with pink just because I get so attatched to the way things are! beautiful!! i love your style. you did great! i love what you've done. :) makes me want to go and perk my place up a bit! what a happy looking home!!! i love the way you started with a corner shot and then with each pic the view became wider. I love the colors in your home! Your home is full of so much creativity and warmth. It felt inviting just to look at. I am wondering about the blue typewriter I see on flickr - what type or brand is it? i love that you can remember how much you paid for each piece. i am the same way but can't remember what day of the week it is! You've found some really lovely pieces! The space definitely looks like a home. If I ever saw your house in real life, you'd have to follow me around with a broom.. to clean up the drool. can i come over and hang out now? NICE. You are making a beautiful home. Excited to see the future installments! wow, there are so many things that i love about this room. so lovely and inspiring with so many beautiful furniture pieces. Adorable! I loove all the patterns and color. So cute. Oh my gosh! My grade 10 English teacher told me the exact same thing about the word "nice"!! I think about her EVERY SINGLE TIME I use that word -- to this day! Love you home! SOOOOOOOOOOO CUTE! Wow! I love everything! So that's where the yellow chairs went to! Lucky! 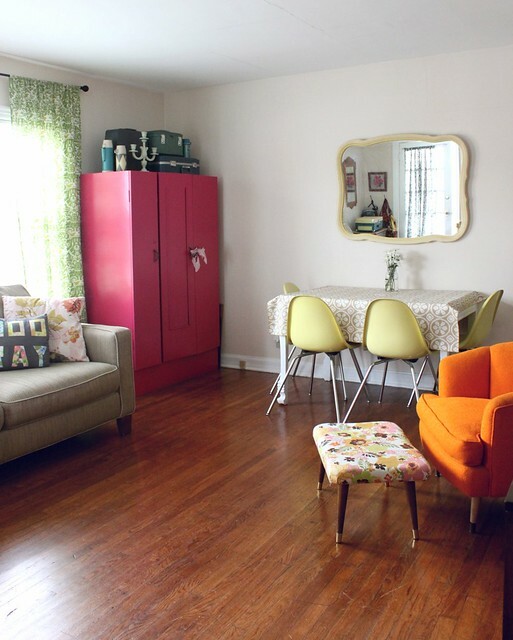 I especially love the pink cabinet and orange chair...the two things you mentioned redoing! ha! It's a gorgeous space. it looks so cute and inviting rachel! 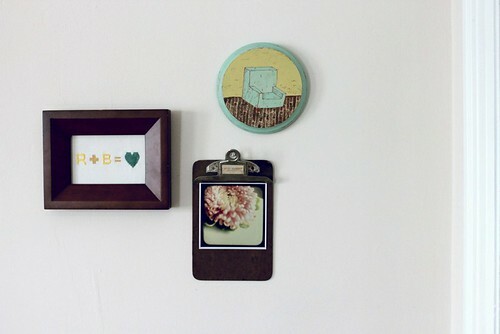 those trays are beautiful (i remember loving them in a past post) and a great little solution for displaying instax photos! Loving this home tour! Thank you for sharing it with us!!! 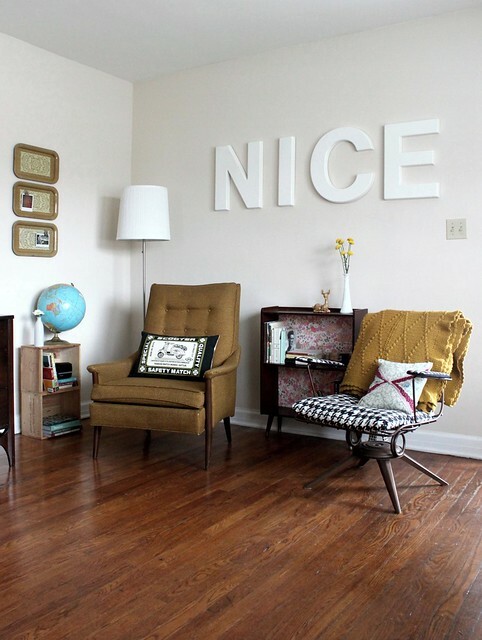 I love the "Nice" on the wall! It's unique and fun. You have such a beautiful house. It must be nice to have it all decorated and done! This is a 'nice' comfortable looking space! You have fantastic taste! oh I love what you did...perfect! So amazing! You have such a rad style. Great job! looks straight out of a magazine! Did you paint the walls too? I like the color and am having a hard time finding a paint color I like! 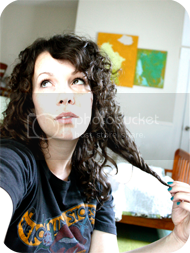 this is my first visit at your blog and I am totally thrilled. I would never have thought I will love those "old" things from my childhood but with your amazing eye for details everything is just perfect! totally inspired now! thank you! drooling. absolutely and utterly perfect. Everything works together so well. Did you make your curtains? Where did you get them? I'm moving and are looking for curtains with some color. I'm over the linen curtains that I have. Love, love, love it! Lots of great inspiration, Rachel. Thanks for sharing. 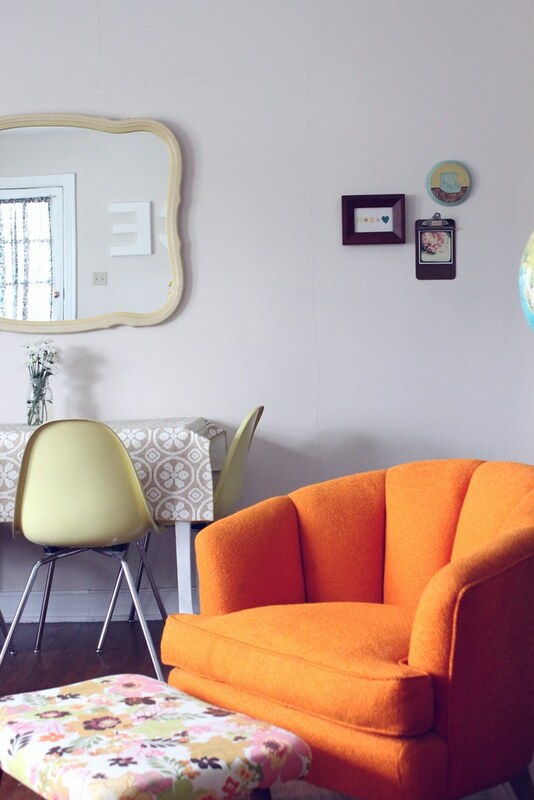 Adore the orange chair! I have two orange club chairs my neighbor took to the dump. We went down to the dump abit later, I saw them, and in the truck they went :) Score! I LOVE your house! I love all the little touches! Beautiful¡ You did such a great job. It looks like such a cozy space--I've been inspired. I love it!! I feel bad for complaining about renting this last move, because there is obviously NO EXCUSE not to make it homey and colorful and bright, from looking at your creation. 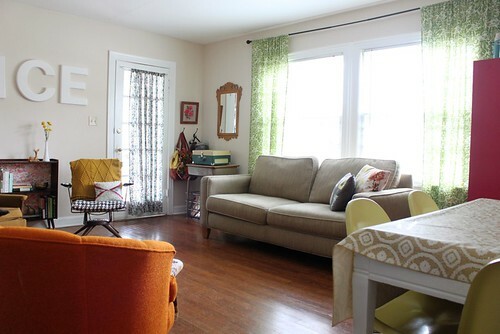 In fact, the next home might have white walls anyway, just to be able to use color and style like you did here. OK I'm in love with everything you own! Don't recover the orange chair, I think it looks awesome the way it is! Stumbled upon your blog. love it! I LOVE the "N I C E" letters on the wall ... it's like the beautiful home is speaking saying GREAT JOB! Wonderful job prioritizing reflecting ur personality + style in ur home!!!! 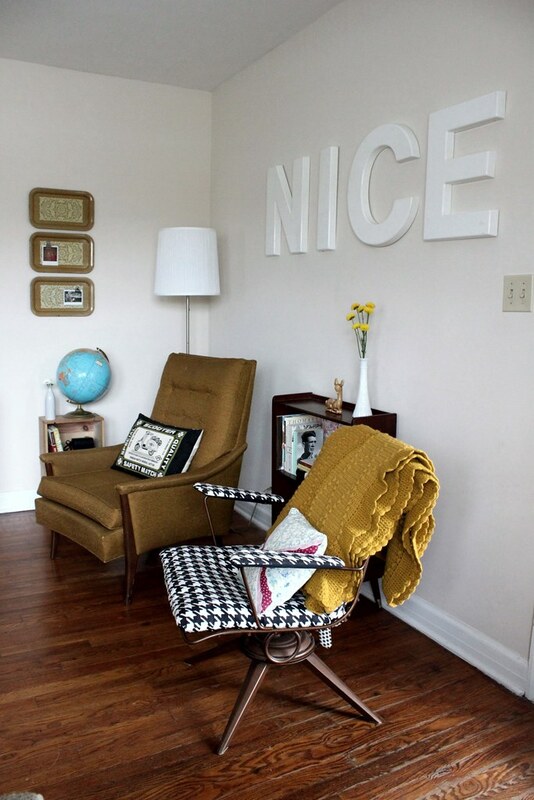 I was wondering where you got the adorable little shelf under "NICE" I want one terribly! I have a chair similar to the one on the right underneath NICE, a swivel office style but the back is higher. I thought mine was a one-off but obviously there are more like it out there!